A five-year R & D project ends with a high-rise retrofit of motorized accordion hurricane shutters. 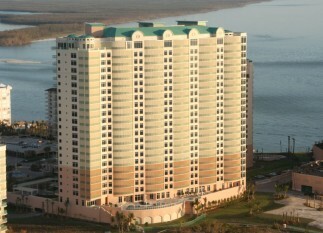 In spring 2004, Kraft Construction Co., Naples, FL, was working with WCI Communities, Inc. on a two-tower condominium project on Cape Marco on Marco Island. At a total of more than two million square feet and $185 million, the project included the Belize and Veracruz, each featuring more than $2 million in accordion hurricane shutters on curved balconies that stretch 30 to 40 feet . The shutters were supplied by High Velocity, also of Naples. At the time, Kraft senior vice president of construction, P. Thomas Abraham, looked to the future saying, “High Velocity says it’s in development and someday they are going to surprise us and have a motorized accordion system, which everyone will be thrilled about. When the 25-story Veracruz tower was being constructed, Steve Camposano, High Velocity, explains that a future retrofit for motorization was in mind. Installed in the tower today are High Velocity’s Category 5® shutter system powered by Somfy. These shutters represent a five-year research and development project by High Velocity with motor design and engineering support provided by Somfy Systems. Key contributors from Somfy included Marty Ackerman, chief technology officer; Jim Hellander, industrial operations manager; and Michael Lee, president and CEO of Somfy North America. The result of this close partnership is a unique hurricane shutter system, and the Veracruz is its first installation in the world. A typical shutter on the Veracruz run 134 inches tall and 30 to 40 feet wide, making it extremely heavy at about 1,200 pounds. Yet the Category 5 system glides effortlessly around the seamless track, states Camposano, a member of the Structural Aerodynamics, Tall Buildings and Wind Effects Committees of the American Society of Civil Engineers. The Category 5 accordion shutter ceiling and floor tracks, he explains, are formed to the exact curvature of a balcony using aircraft manufacturing technology and equipment purchased from Boeing Aerospace, Everett, WA. With 60-ton capacity, it stretches and forms tracks up to 300 inches wide, reducing the drag during shutter operation because of one-piece curve capabilities. The custom computer control and programming came from defense contractor DeMott Technologies, Van Nuys, CA. This equipment had been classified because it was used in the production of F-18 fighter jets. Using Radio Technology Somfy® (RTS) the shutters can be operated by a wireless wall switch or a handheld remote available in a one-channel and five-channel version. They feature an obstacle detection system that stops the shutters when any obstacle is detected. Residents also can opt for Somfy’s IP interface that will allow them to operate the shutters from a computer wherever they happen to be. That’s an ideal option for many of the residents who do not live in these spaces year-round. Typical of high-rise condominium projects, hurricane protection takes more than one form on these towers. The fronts, or street sides, of the buildings have fewer and smaller balconies, if any. But the backsides, which provide the water view, have big, expansive balconies that need to be protected. Not only do the hurricane shutters protect from storm damage, they also provide security, light and UV-protection. This is especially important for the furnishings and plants the owners often don’t like to pull inside at the end of the season. An important consideration, too, are the residents themselves. A conventional accordion shutter can present complications. For example, there is ease of operation. Developers have to plan on a 70-year-old man or woman living in these condos—even if it be in only two out of tower’s 101 units. The shutters must be suited for smaller, elderly residents as well as for younger residents. The shutters specified are rated for Enhanced Hurricane Protection under SBC designation of the FBC. The accordion track can be radius curved to 90 degrees in less than 30 inches. Another of the advantages of using an accordion shutter system is the relatively small stack-back required. When open, a full view is accorded, which is especially important for residents who have moved into these high-rise condos for just that reason. Another advantage is aesthetics. High Velocity custom colored the shutters it installed to match the building colors, so in the event that everybody has them closed in the summer months when the building is empty, the exterior maintains its architectural features. Posted in Florida, Hurricane Shutters, Marco Island, Naples, News, Somfy. Tagged florida, hurricane, Marco Island, naples, Radio Technology Somfy, RTS, shutters, Somfy.